Mailchimp's signup forms, audiences, and campaigns can help you manage CASL requirements. This article is provided as a resource, but does not constitute legal advice. If you have more questions, we encourage you to contact an attorney in your area who is familiar with this issue. CASL requires that you include a few pieces of information in each campaign you send. Luckily, Mailchimp's Campaign Builder includes a drag-and-drop Footer content block, which pulls that required content into the campaign with merge tags. To make sure your merge tags display the right information, visit the Required email footer content page. Click the Manage Audience drop-down and choose Settings. Click Required email footer content. Edit fields as needed and click Save. Most footer templates already contain the unsubscribe merge tag, *|UNSUB|*. Take a quick look in the Campaign Builder to verify the tag is there. If it isn't, follow these steps. In the Content section of the Campaign Builder, click Edit Design. On the Design step, click the footer block. 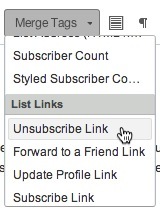 In the editing pane, type in the tag *|UNSUB|* or choose the Unsubscribe Link option from the Merge Tags drop-down menu. If you send a lot of campaigns, or have several users on your account, you may want to add the required information to a campaign and reuse it, or create a template. If a lot of the people in your audience have only given you implied consent to receive your messages, you'll need to ask those contacts to explicitly opt-in to receive your Mailchimp campaigns. There are a few steps to this process. Click the Manage Audience drop-down and choose Manage contacts. Click the Create Groups button . On the Groups page, click As checkboxes. In the Group names field, enter "I consent" or similar statement. Use the minus icons to remove extra group fields. 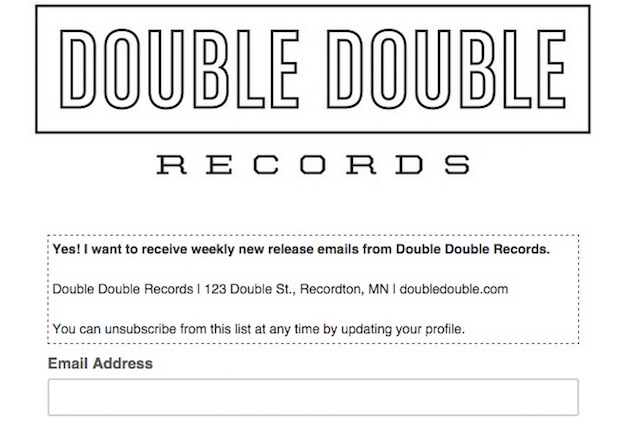 Your contact information and a description must appear on both your Signup form and Update profile form. You may also choose to edit your Update profile email and Update profile email "thank you" page to reflect CASL's changes. After you've created the consent group and updated your forms, it's time to create an email campaign whose primary focus is a link to the Update profile form. Build a campaign as you normally would, and use the merge tag *|UPDATE_PROFILE|* as the link for text, an image, or a button somewhere in your campaign. We'll replace the merge tags with a URL of the subscriber's update profile page anywhere the merge tag appears. To add the merge tag, edit a content block and type the merge tag into the Web Address (URL) field for the text, image, or button you want to link. To get the greatest response from your subscribers, you may need to send your Update Profile campaign a couple of times. You could even use an A/B Testing Campaign to test the most effective day or hour, to make the most of each send. Each time you send the Update Profile campaign, be sure to segment your audience. Remove anyone in the new consent group as well as new subscribers who signed up after the date you updated your signup form, so you don't ask them to consent twice. To send through Mailchimp, all audiences must be clean and current, so we suggest only sending to contacts who have opted-in in the past 12 months. Sending to older contacts often generates many bounces, unsubscribes, or abuse complaints, which can result in account suspension. You can use a third-party service if you need to clean your audience before using Mailchimp. To comply with CASL, you can only send to subscribers who have given express consent. To do this, bulk unsubscribe all subscribers who aren't in the consent group and who signed up before you updated your signup form. To remain in compliance and keep a healthy audience moving forward, you should remove out-of-date subscribers no later than one year after you start the signup or cleaning process. To get proof of consent data, just export your audience. 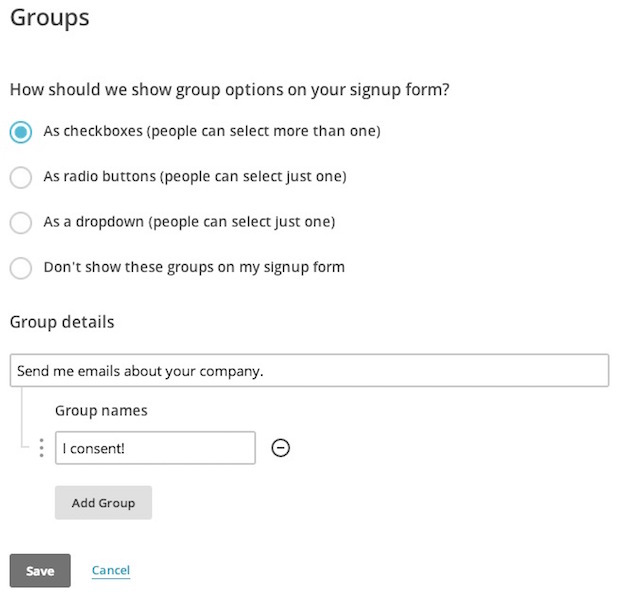 If you only want to see who's in the consent group, view or export segments of your audience. You may want to keep a copy of your signup form also, in case you need to prove that the form included all of CASL's required information. 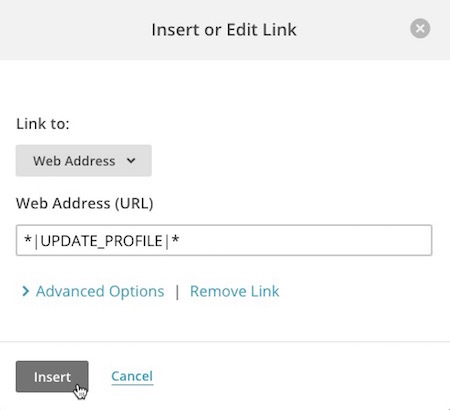 OPTIN-TIME: If double opt-in is turned on, this column will display the date and time the contact clicked the link in the opt-in confirmation email. OPTIN_IP: If double opt-in is turned on, this column will display the IP address when they accessed your hosted signup form. CONFIRM_TIME: When the person originally clicked to subscribe to your marketing. CONFIRM_IP: The IP address from which they confirmed their subscription. 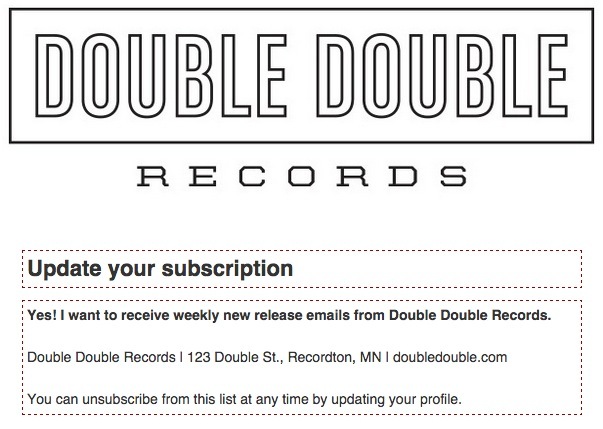 Mailchimp tracks this information through your signup form, so we can't determine it for subscribers you import. To be safe, you should also have proof of consent for imported subscribers in a separate document or in hidden text fields in your Mailchimp audience. Learn about the Canadian Anti-Spam Law and what it requires. Learn about anti-spam requirements for Mailchimp's email platform and make sure your campaigns are compliant.